An informative and appealing full-color guide for new and devoted juicers alike. 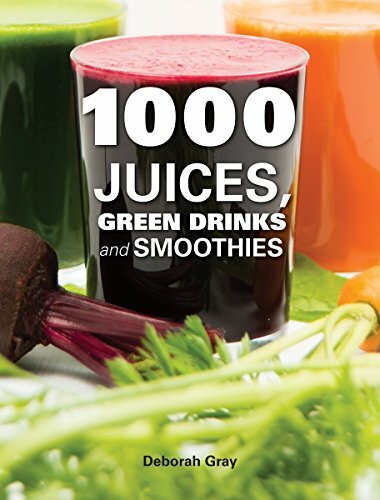 1000 Juices, Green Drinks and Smoothies is the ultimate guide to juicing, with 100 foundation juices and 900 variations. It provides all of the essential information on equipment, fruit and vegetable ingredients and their health benefits, dairy products and non-dairy alternatives, sugar substitutes, nuts and seeds, flavorings, and supplements and additives. The book contains seven chapters, with each base recipe having at least two variations. There are also handy tips, notes on health benefits and suggestions for special diets. Mocktails — Sassy, alcohol-free drinks, such as Virgin Mary and Egg Nog. 1000 Juices, Green Drinks and Smoothies is the ultimate guide to this national food and health sensation.